Hello everyone. I am Caesar2013, I've been a fan of Resident Evil for many years and have decided to join your forums. I like to write fanfiction, cosplay. I hope this is a good enough introduction. Welcome Caesar, hope you enjoy your stay. We have fan fiction and RP sections in the Resident Evil Discussion part, in case you want to share your creations and join in on the game. Thanks, but as the new guy I can't show off my latest fanfic until like a week from now. Oh well, that gives me time to immerse myself in the site. Also I've pretty much played all of the games except for 0. So I guess I know enough of the story lol. It's always good to have people familiar with the series 0 is thus far literally the only game in the entire franchise I have not had a chance to play. Thankfully the HD version is coming soon enough so I can rectify that. Yup, I plan on getting from Steam as soon as possible. Vandal will crush you. And make sure to stay out of the basement, lest PWNERX goes Fifty Shades of Gray all over you. As for me, I only demand complete and total obedience. Is that so difficult to accept? We keep the admins in the basement. And I will eat your mustard flavored soul. Do they got Popsicles from a freezer full of them, down in the basement? I'll take 20! And why's the missing paper boy down there? 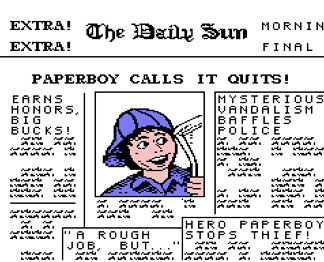 He didn't deliver the papers fas enough. He also destroyed a large amount of REF property and stopped the guy I hired to kill Paul WS Anderson. I am Maximus Decimus Meridius. and stopped the guy I hired to kill Paul WS Anderson. That was me, I want at least one more AvP movie first. All these guys versus Ash from the Evil Dead. HINT: Ash always wins. Or gets thrown into another time or universe before the fight can be settled. And we also have to have Gerard Butler from 300 there, for good measure. This is madness!!! I'd watch it with Gerard Butler in it. ^-^ Maybe a more clothed one though, and not all roided up. Did Teh_Spike mention Megan Fox will co-star wearing a thong bikini. It's hawt. Just about every piece of the Evil Dead involves this, except for The Evil Dead and the reboot. Ash has been to everywhere from Reanimator territory to the Middle Ages to ancient Japan to redneck country to the future to Camp Crystal Lake to Elm Street to nightmare Elm Street to the White House and beyond. She'd be the first to get slaughtered in the middle of it all because she'd be the only idiot in the movie.